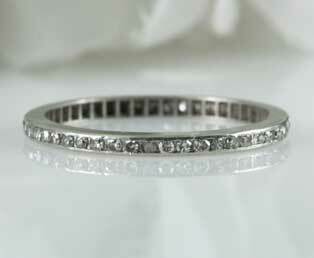 A continuous line of diamonds creates this tasteful estate diamond anniversary wedding band. This thin eternal line of small bright diamonds forms a dainty eternity wedding band. This circa 1930s Art Deco eternity wedding band consists of forty-eight small single cut diamonds. This narrow estate anniversary ring brings a delicate, yet bright shine in sturdy platinum. A perfect estate ring to compliment your antique engagement ring.